Breakfast in bed is the kind of pampering that both men and women appreciate. When you’re in doubt as to what to do, or just want to add another romantic element to your day, it can be a classic romantic gesture to do for your love. This Valentine’s Day, you can make their breakfast in bed an extra-special event by adding some unique Valentine sweetness. Below are few ideas to help you start your Valentine’s Day off with a perfect breakfast! Use large heart-shaped cookie cutters to punch out cookies, biscuits, French toast and waffles (the waffles and toast can be punched out after they are cooked). 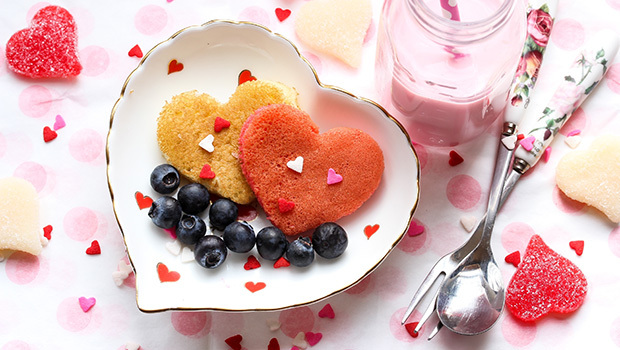 Use the cookie cutters on a hot grill to pour heart-shaped pancakes (spray the cookie cutters with nonstick spray before you pour in the batter). If you aren’t into cooking, you can always purchase foods from a local bakery or restaurant. Buy heart-shaped extras like pastries or sugar cubes for their coffee (sugar cubes also come shaped as X’s and O’s). Freeze ice cubes in a heart-shaped ice tray. Use berries to give your breakfast a Valentine’s theme. Freeze raspberries, strawberries, and/or mint leaves inside ice cubes. Make pink, red, and white drinks like fruit smoothies or a morning blended cocktail! Or simply add any red berries to juice or smoothies. Garnish the plate or drinks with fresh berries. If you remove the green thoroughly from strawberries and cut them in half, they look like little hearts! Cook berries into, or melt pink and red sprinkles on top of pancakes, muffins, or cinnamon rolls to give them color. If they are a tea lover, serve something special like a flowering tea. It is tea wrapped in such a way that when the tea leaves are rehydrated, the leaves and petals unwind to reveal an exotic flower pattern. Make sure to use a clear glass mug so that your love can see it. If they are a coffee lover, treat them to an exotic blend. Using a French press or other unconventional brewing methods can help bring out the flavors for an extra-thoughtful cup of joe. Use a heart-shaped rock as a paperweight for paper napkins, or use heart-shaped napkin rings for cloth napkins. The breakfast tray can be used for more than its practical purposes. Line the breakfast tray with a special placemat, or decorate the tray itself!! Every year I make breakfast for him, but this year I decided to add something new. I went to the local craft store and bought a wooden breakfast tray. I painted it his favorite color and added photos and mementos, kind of like a scrapbook page. Then I poured Mod-Podge over the top and let it dry. Lastly, I wrote a love note around the edge of the tray. It cost only ten dollars to make, but the memories will last forever! Another romantic idea would be to write them a love note or letter and set it on the tray. It could be lengthy and thought out, or just a simple note like, “You’re my favorite person in the world!” If you have other things planned for Valentine’s Day, you could leave a printed itinerary for the day or an “invitation” to the evening’s big event on the tray. I went online and ordered a fake newspaper to give to my boyfriend on Valentine’s Day. The story I selected (you can write your own story if you want) is about a girl who hacked into the traffic advisory signs and posted the message (my name) loves (his name). The article has an actual picture and the advisory sign in the picture can read whatever message you want. However simple or extravagant, breakfast in bed is a sensational way to begin a special Valentine’s Day with your love.